The VWR BOD Incubator 2005 provides a broad temperature range for BOD applications in a compact footprint. 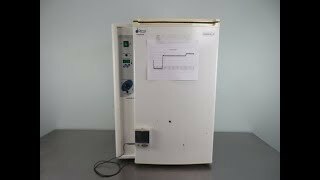 This low temperature incubator has a volume of 2.4 cu ft, and takes up a small 2 sq ft footprint, letting you keep it on a lab bench, or tucked away underneath. With a temperature range of 0-45°C and microprocessor control, this refrigerated incubator is a great choice for BOD determinations, fermentation studies and bacterial culturing, as well as plant and insect studies. Temperatures are set from the touch pad control panel, set on the side of the incubator, along with controls for the safety high/low limit thermostat. Inside this BOD incubator, is adjustable shelving, an easy to clean lined interior, as well as a convenient electrical outlet to support additional instrumentation such as shakers or rotators. The VWR BOD Incubator 2005 also features a hermetically sealed compressor, and gentle forced air circulation for a chamber uniformity of +/- 0.5°C at 20°C. This VWR B.O.D Incubator Model 2005 CAT 35960-056 has been fully inspected and is operating without issue. Please note there is a slight blemish inside the chamber however it does not impact performance. All of our lab equipment comes backed with our standard warranty. Should you have any questions about this or any or our incubators, plesae don't hesitate to contact us.